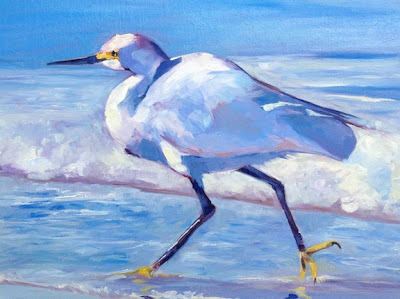 My fellow artist friend, Rick Nilson, lives in Kitty Hawk, North Carolina and paints beach scenes and beach critters and boats like I paint horses and cows - only better! Every now and then he paints a horse, and I feel compelled to paint a shore bird. So this is my tribute to Rick. My daughter moved to Bay City, Texas last summer and I have only seen her twice since then. I miss her and her family terribly, but I know she is happy in that hot, sticky coastal climate, where she can garden year round, fish in Matagorda Bay and actually play in the rain. They are coming to visit Wednesday, and I do not know if I am more excited about the sea trout they promised to bring or seeing my granddaughters!!! I will send you rain in its season, and the ground will yield its crops and the trees their fruit. you are so nice to me. I thought of Rick the second I saw this painting! You did a great job with it.